Rev. Philip Simo, OSB – Spiritual Advisor for the Archdiocese of Washington Ladies of Charity (ADW LOC) installed new Board members. 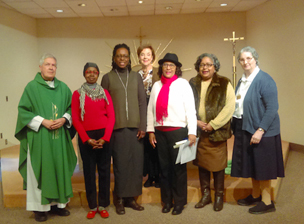 As pictured from left to right, Father Simo, Gloria A. Lessington – 2nd Vice President, Robin Hutchinson-Cole – Corresponding Secretary, Mary Hand – Acting Treasurer and Immediate Past President, Viola Johnson-Robinson – President, Donna Fisher – Recording Secretary and Sister Sandra Goldsborough, DC – Spiritual Moderator (retired). The Board is looking to fill two vacancies. A replacement for the Spiritual Moderator and a 1st Vice President. Hopefully, these positions will be filled soon.